Because astronomers know that you can't have electric currents in space, they chose to misname the accelerating ions radiating from the sun a "solar wind." 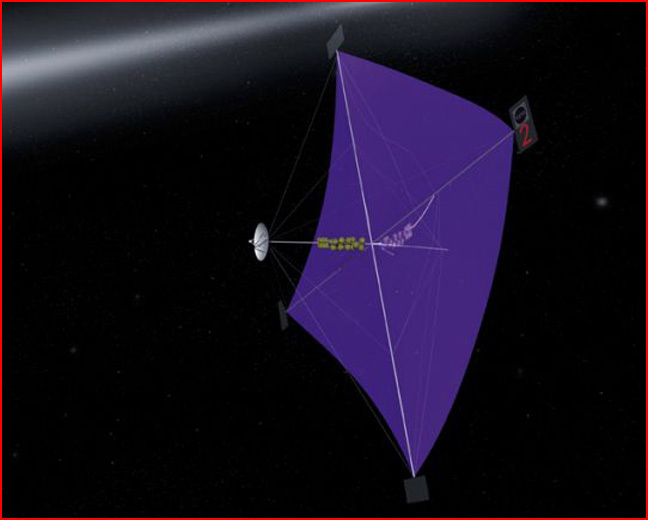 It is this metaphor that has led them to allocate funding into researching the possibility of using sails to catch the solar wind as propulsion for future spacecraft. The currents of space, as electrical phenomena, have greater potential than turning future astronauts into wind-surfers. And that potential is mostly untapped, first because astronomers don't recognize electrical phenomena in space, and second because plasma phenomena are complex and not fully explored yet. In many areas, the behavior seen in plasma labs is very different from that predicted by classical plasma theory. Alfvén discusses this example. He compares theoretical predictions to laboratory results when a plasma beam moves parallel to a magnetic field, both moving horizontally. What happens to the plasma beam if the magnetic field curves down? Theoretical calculations came up with four possibilities: two of them expected the plasma beam to curve downward to match the magnetic field (for two different reasons); one expected the plasma beam to ignore the curve of the magnetic field and continue moving in the original direction; the last also expected the plasma to continue moving forward, but it would pull and stretch the magnetic field along with it. In actual laboratory tests, the plasma didn't follow any of the predictions. Instead, when the magnetic field curved down, the plasma beam curved up, then curved back to a direction parallel to but above the original direction. In Alfvén's words, "Although the theories were generally accepted, the plasma itself refused to believe in them." What does this mean for space flight? It means that the potential for tapping the plasma universe for propulsion has barely scratched the surface. At the Australia National University in Canberra, researchers have been developing plasma thrusters. If the solar sail above is thought of as a sailing ship in space, then the idea of a plasma thruster is like an electrified rocket. The advantage over a normal rocket is that it can use fuel that is readily available anywhere (even off-earth), and although its thrust is much weaker than a normal rocket, it can be used for much longer burns. But plasma plays by different rules than rockets, and one of the researchers discovered that she got a lot more thrust when she decreased the power and increased the magnetic field. The plasma formed double layers, which acted like waterfalls to accelerate the ions up to 10 km/sec. In the researcher's words: "one, two, it's already on the other side of Canberra." She continues: ..."the plasma behaves like water tumbling over a cliff, getting faster as it drops. And, just like an aurora, it seems that the plasma actually makes the "cliff" - all by itself. It's almost magic." Plasma cosmologists have explored the "magic" of double layers for decades. If they weren't considered enemies, the two groups could share the benefits of their separate experiences. In the as-yet-unknown behavior of plasma, there are secrets hidden that are as far beyond the imagination of today's explorers as jet airliners were beyond Columbus' imagination. 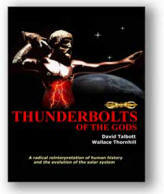 It's time to drop the gravity-only universe and begin exploring the promising new concepts of the electric universe. The stars may be within our reach.